1987 Wellcraft Nova Spyder 26 1987 Wellcraft 26 Nova Spyder w/ Twin 350 MAG's (270 HP Each) MerCruisers!! Thru-Hull Exhaust w/ Stainless Steel Angle-Cut Tips! Stereo System w/ Beach Speakers / Amp / Equalizer, Fresh Water System w/ Sink, Trim Tabs, Depth Finder, Compass, Snap-In Cockpit Carpet, Dual Battery Switches, Fire Extinguisher System, SS 4-Blade Predator Props. Cockpit Cover. Fresh Full Service w/ Oil & Filter Changes / New Fuel Filters / New Sea Pumps & Impellors / New Thermostats / New Batteries / New Gimble Bearings / New U-Joints / Fresh Drive Gear Lubes! Includes a Eagle Tandem Axle Trailer w/ New Tires. Boat is in Great Condition! Well Maintained! 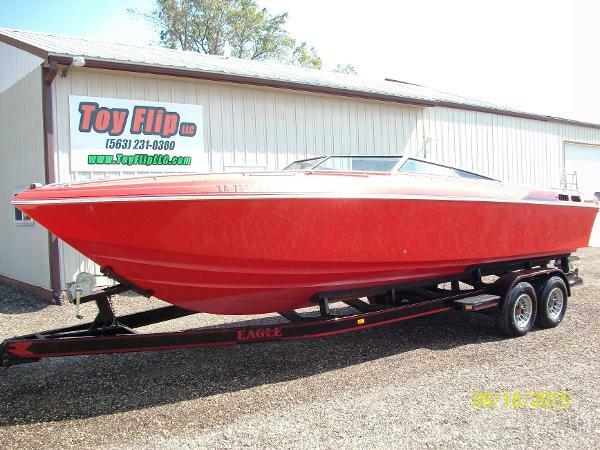 Hard-to-Find Twin Engine 26' Performance Boat! !